The Diamond Braid quilt top is finished. It is twin-sized measuring 72″ x 92″. 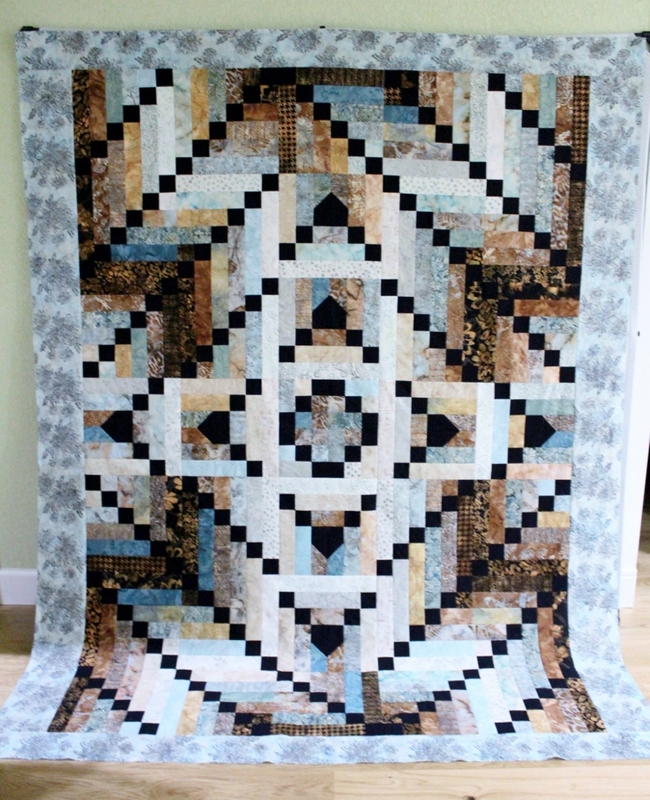 The blues in the quilt is really more aqua/turquoise than the photograph shows. I was unsuccessful in getting a picture of the quilt shown in the pattern since it was printed on shiny paper. Here is a link to the original Diamond Braid for comparison of the middle block. 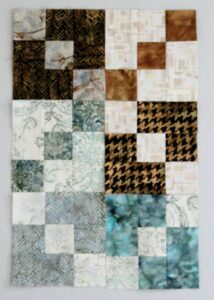 I always knew that I would be replacing the applique in the pattern with a pieced block and I am very pleased with the final result. I used two Brown Sugar Hoffman Bali Pops along with a few pieces of extra yardage for the top with 24 full length strips left over. Usually I put the extra strips back in the 2 1/2″ bin, but today I decided to play with them. There was enough fabric to cut out 9 Bali Sea Stars (from Scrap-Basket Surprises by Kim Brackett) and 32 Carolina Chains (Addicted to Scraps by Bonnie Hunter). I don’t have any plans for these blocks yet – just enjoying the sewing.